Existing patients can also log into their patient portal account to request an appointment. Common complaints by patients, including nasal congestion, post-nasal drip, facial pain and pressure, and decreased sense of taste and smell, can all be related to underlying sinus disease or allergic rhinitis (seasonal allergies). At Atlantic ENT, we offer a variety of diagnostic tools and surgical options for the identification and management of these problems. 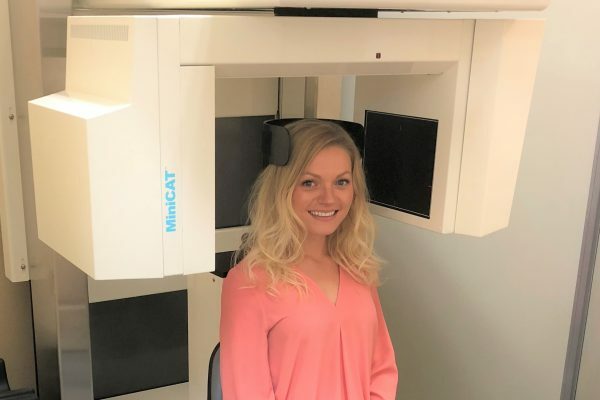 Sinus CT imaging is available at our Orange City office with our in-house, low dose seated CT scanner. This is quicker and more comfortable than conventional CT scanners. The mini-CAT scanner enables our providers to visualize the sinuses and important surrounding structures in order to assess for further medical or surgical intervention. 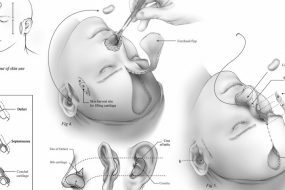 Balloon Sinus Dilation is a safe and effective procedure for some patients suffering from chronic sinusitis who do not respond well to medications. In office balloon sinus dilation is a minimally invasive procedure that is performed by our physicians, and allows the physician to reshape certain drainage pathways of the sinuses in order to restore normal mucus drainage. Typically, patients experience a quick recovery, and most patients return to normal activity in 24 hours. 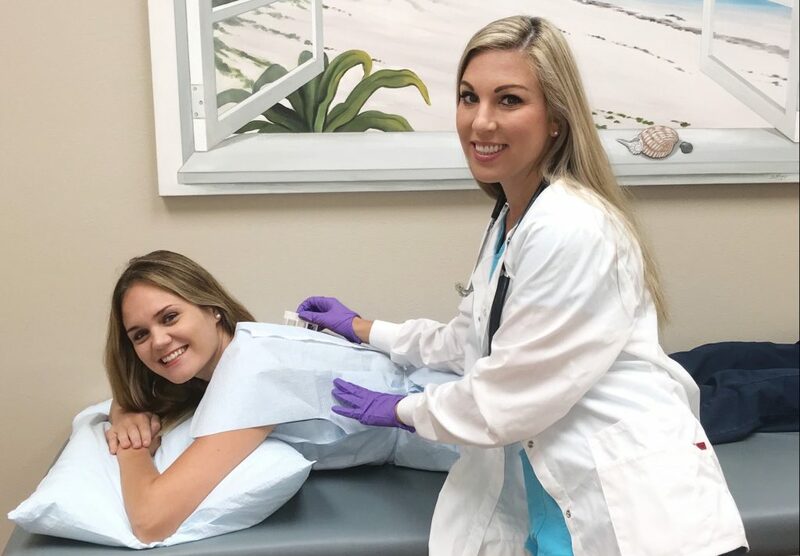 Allergy skin testing is performed in office, and consists of prick testing on the back followed by skin testing on the arms. This testing allows your medical provider to not only identify whether or not you have allergies, but also to determine the severity of your allergies. At the end of the visit, this information and strategies for avoidance will be reviewed with you. 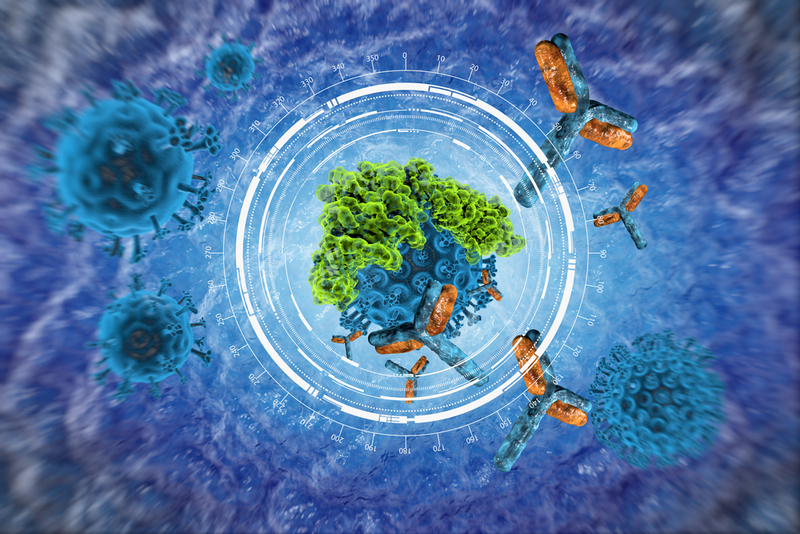 Allergy immunotherapy is the only treatment that treats underlying allergic disease, whereas medications attempt to manage allergy symptoms. Allergy immunotherapy retrains our immune system to stop reacting inappropriately to normal things in the environment, such as pollen and animal dander. 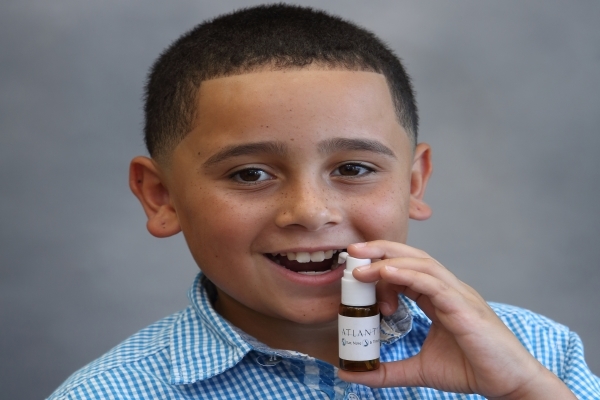 Allergy drops are a form of immunotherapy that is offered at Atlantic ENT. The drops are able to be self-administered at home rather than several times weekly in office, and are considered safer than allergy shots. 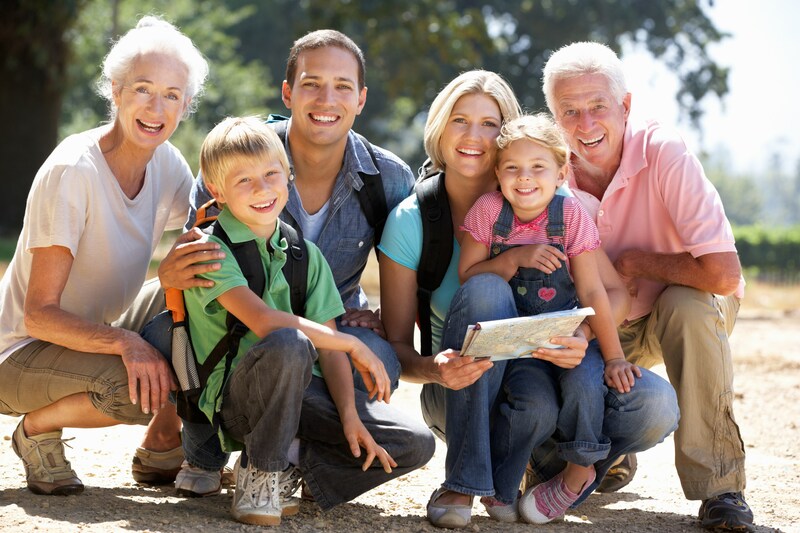 Hearing loss is a common complaint, and can be the result of a variety of medical issues and environmental factors. This can result in significant developmental delays in children and social isolation in adults. 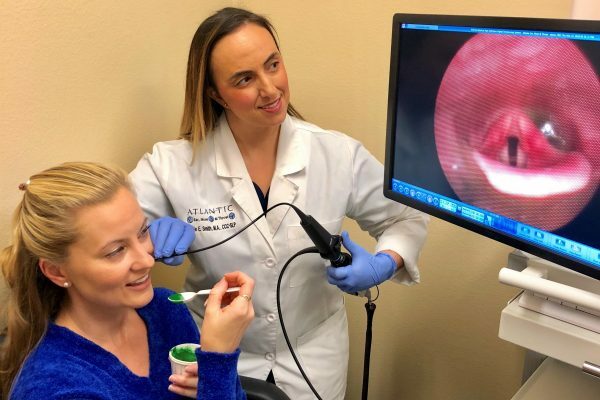 At Atlantic ENT, we offer a variety of services to evaluate and treat many causes of hearing loss, including tube placement, cerumen removal, audiometry, and hearing aid evaluation and fittings. 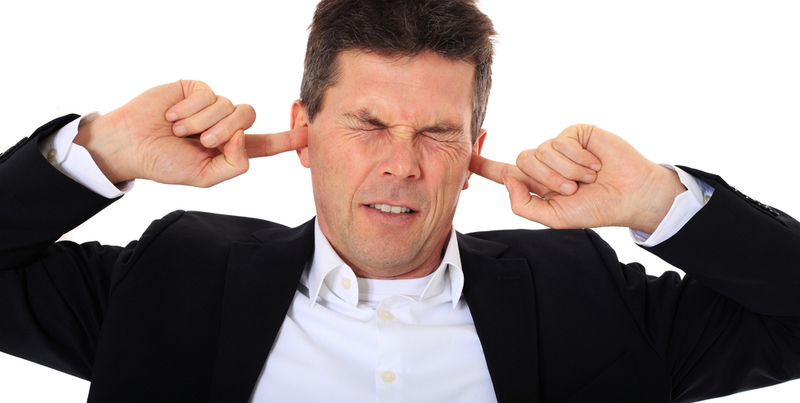 Tinnitus is a common complaint, and is typically related to underlying hearing loss. 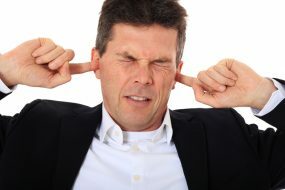 Management of tinnitus depends on the type of hearing loss you have. 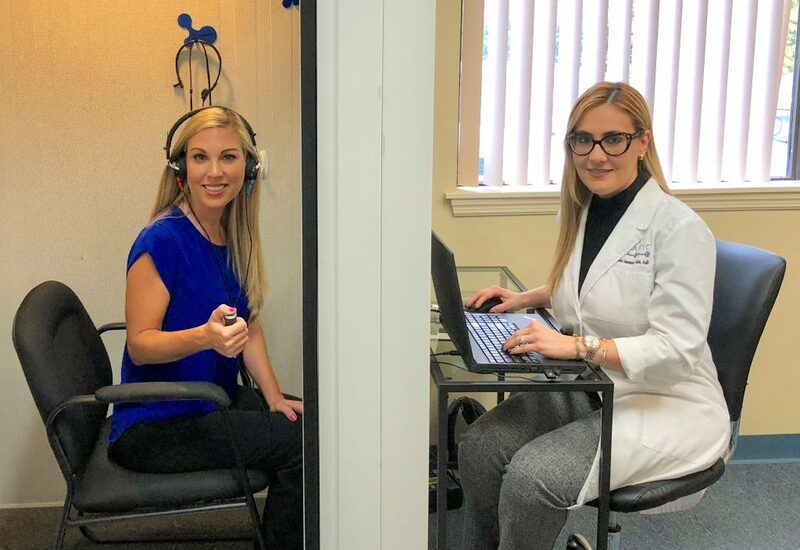 Our audiologists perform a variety of tests to fully evaluate a patient’s hearing, identify the cause of hearing loss and/or tinnitus, and provide information regarding the most effective treatment options. Our audiologists work hand-in-hand with our providers to provide patients with comprehensive medical care. If you are a candidate for hearing aids, an audiologist will evaluate your individual needs and help you select the style, technology, and brand that works best for you. Dizziness is a symptom which can describe many different sensations depending on the person experiencing it. 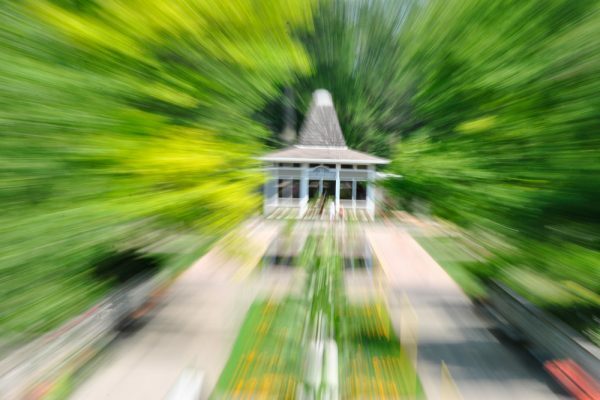 Similarly, there are many potential causes of dizziness, and more specifically, vertigo. 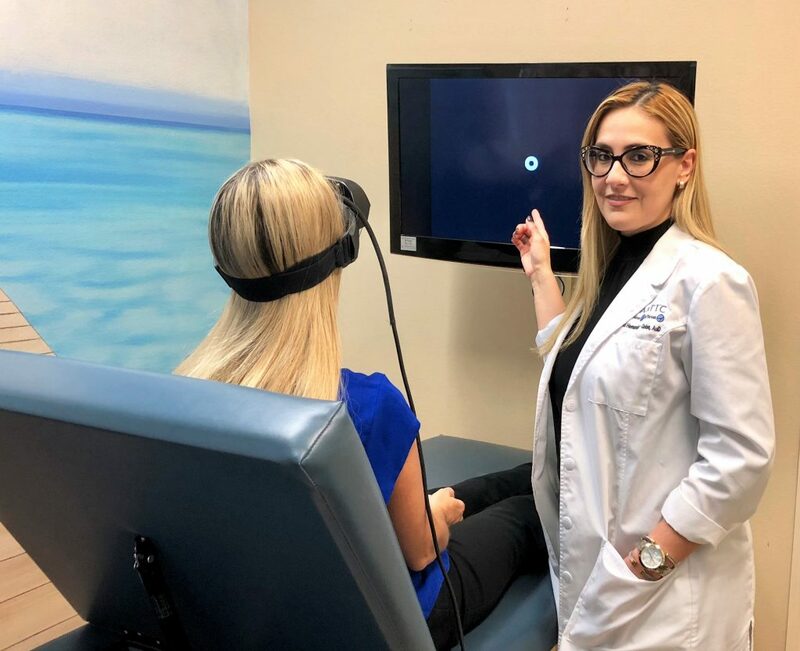 We embrace a team approach for diagnosis and treatment of dizziness and balance disorders, and thus work closely with our audiologists as well as other specialists to find out the cause of your symptoms. 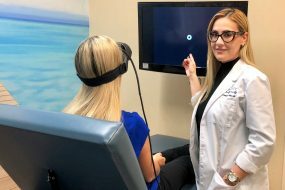 Videonystagmography (VNG) is a non-invasive exam which assesses the vestibular, or balance, system. The VNG gives us a great deal of information about your vestibular system in order to determine if it is functioning properly. 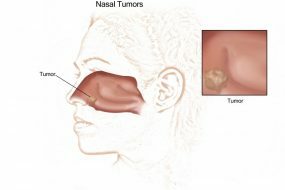 Based on the results, treatment, such as medication or specialized therapy, may be recommended. 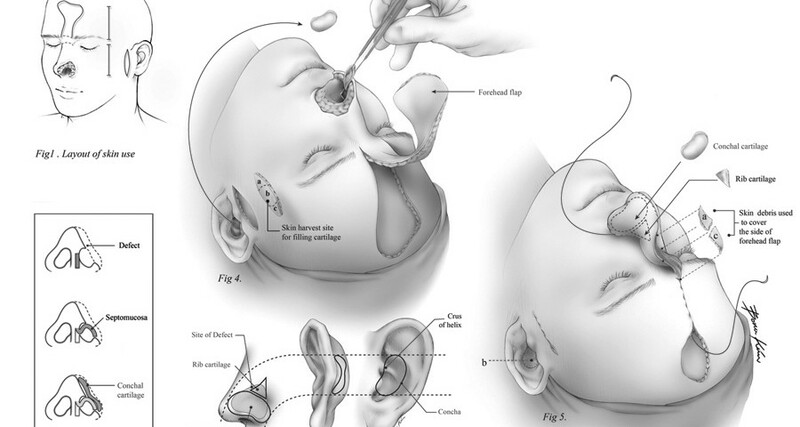 The larynx (or voice box) is where we produce our voice. Common symptoms of problems with the voice box include hoarseness, vocal weakness, sore throat, and coughing. 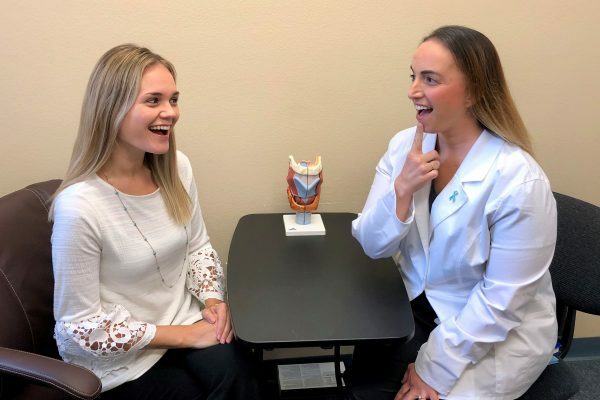 We offer several diagnostic tests, performed either by our medical providers or our speech language pathologists, that help to identify the cause of these symptoms. 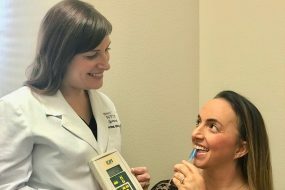 If needed after routine examination by one of our healthcare providers, you may be referred to one of our speech language pathologists for this study. 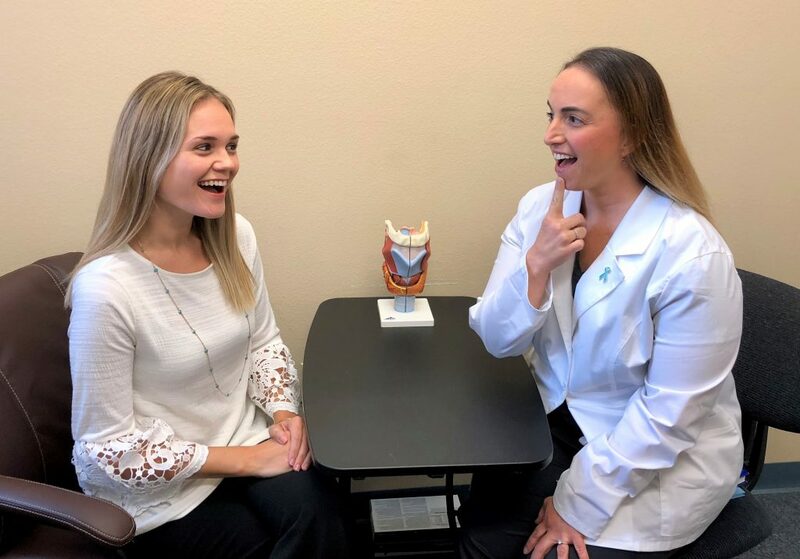 This allows us to not only see the structures of the voice box in detail, but also to assess the way that you are using the muscles of speaking. Voice (or speech) therapy is a customized program based on the findings of a videostroboscopy. 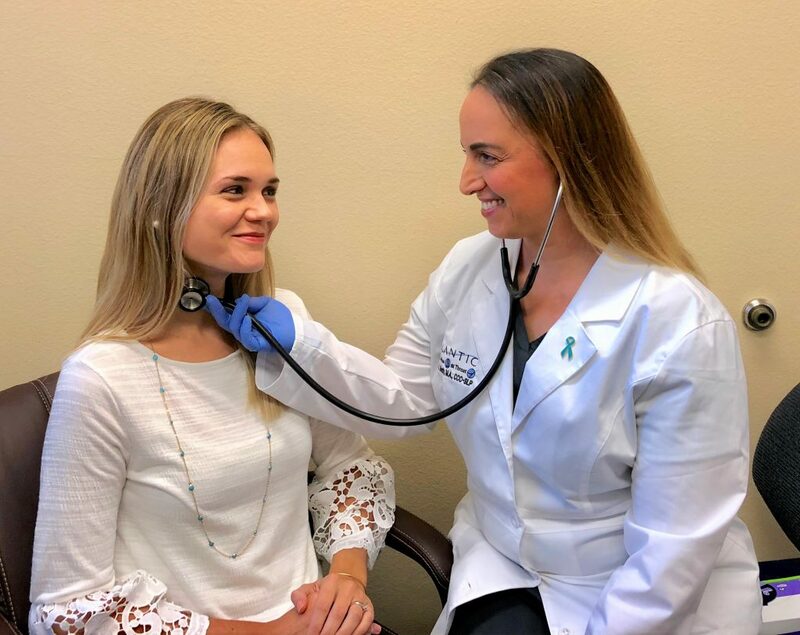 During a session, you work individually with a speech language pathologist, who helps you to vocalize in a less traumatic way, resulting in improved voice quality and reduction in associated symptoms, such as sore throat or the sensation of something stuck in the throat. Every structure, from the mouth to the voice box, has a role in the eating and swallowing process. As such, it is important to identify any problems with these structures that may be affecting your ability to eat and drink. Our providers work closely with our speech language pathologists to fully assess and manage swallowing issues. 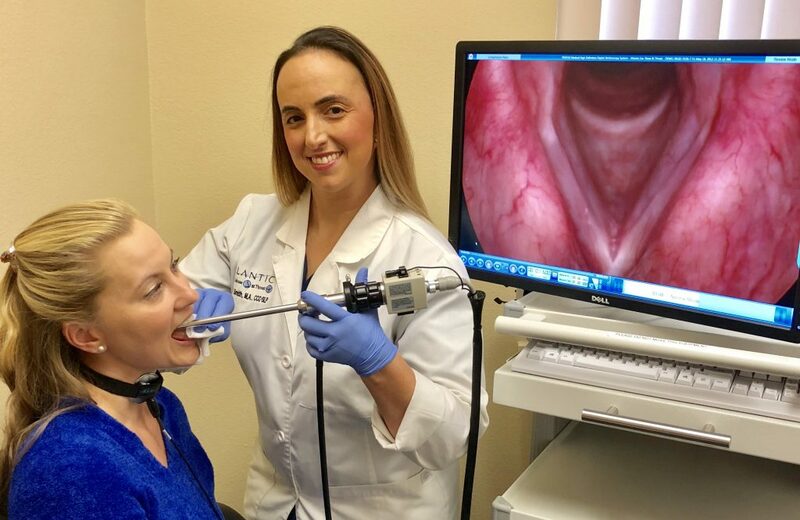 Fiber-optic endoscopic evaluation of swallowing (FEES), is a more detailed examination of the mouth, throat and voice box area that helps to identify both physical and functional changes that may contribute to difficulty swallowing. 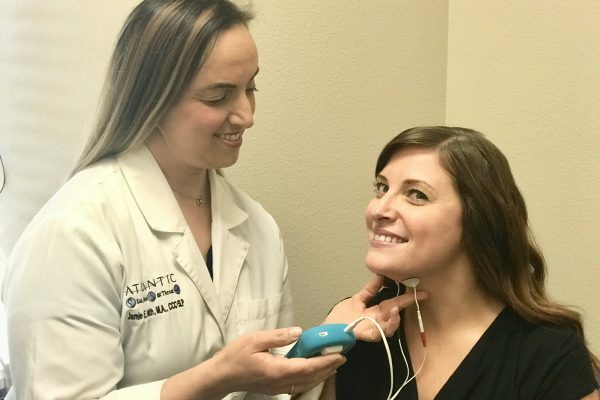 Based on the results of these tests, you may be recommended to continue following up with our speech language pathologists for swallow therapy. 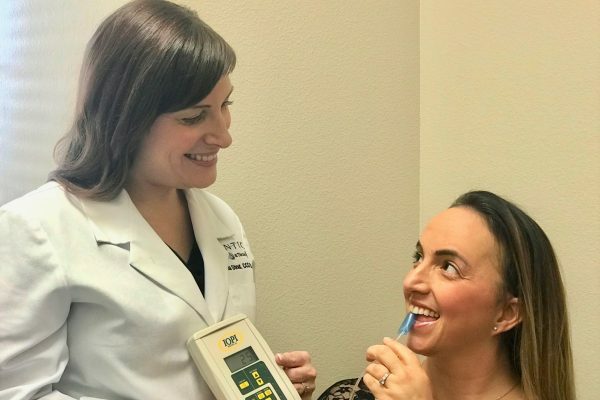 Iowa Oral Performance Instrument (IOPI) uses an air-filled bulb the lips or tongue press against to measure muscle strength and to provide resistance during exercise. Recordings of strength are digitally shown to provide feedback and the ability to increase intensity to maintain muscle overload. Neuromuscular Electrical Stimulation (NMES) is a non-invasive, painless treatment that uses a small portable stimulator which generates customizable electrical pulses. 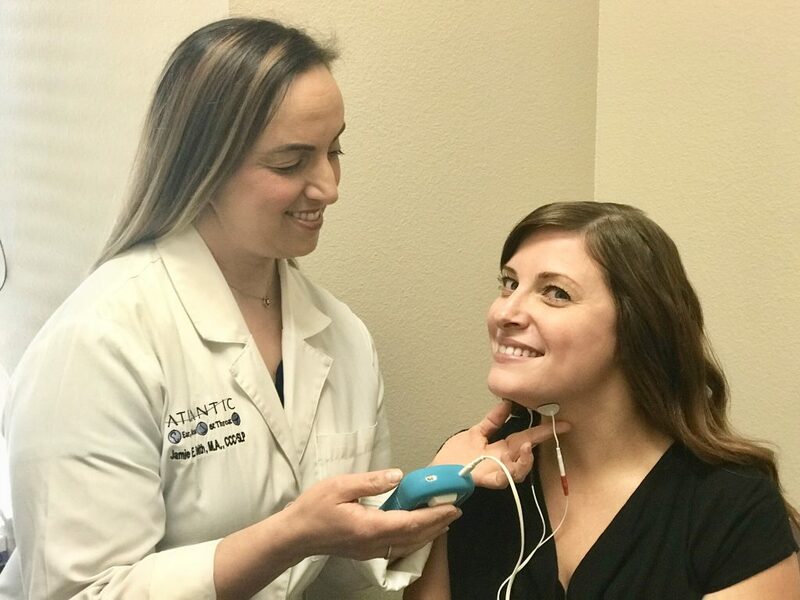 These pulses flow through a lead wire to a pair of small electrodes placed on the facial muscles or under the chin to stimulate the motor nerves that result in muscle contraction. Therapy involves resistance exercise paired with NMES to improve strength, timing and reeducation of the swallowing muscles. 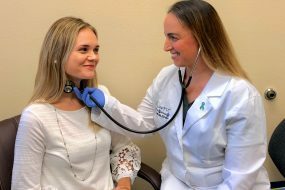 As with speech therapy, our speech language pathologists formulate a customized treatment plan for those suffering from difficulty swallowing. 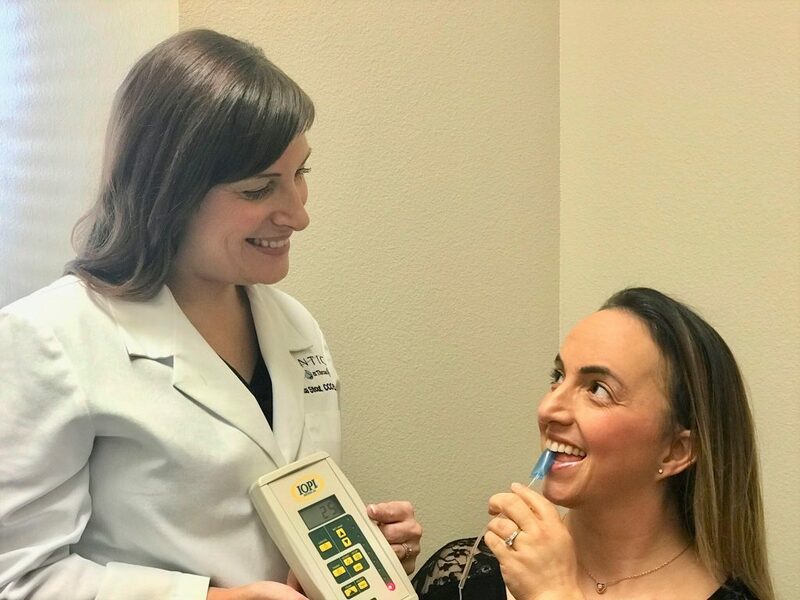 You will undergo one-on-one sessions with one of our speech language pathologists, who will help you to improve the functionality of swallowing. This ensures that you are able to eat and drink safely, without putting yourself at risk for such complications as aspiration (food or liquid going into the lungs through the voice box). The SPEAK OUT! 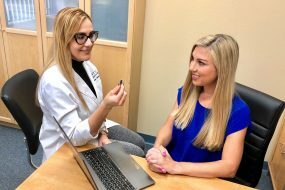 ® speech therapy program preserves the voices of individuals with Parkinson’s and related neurological disorders such as Essential Tremor, Lewy Body Dementia, Progressive Supranuclear Palsy and Multiple System Atrophy. 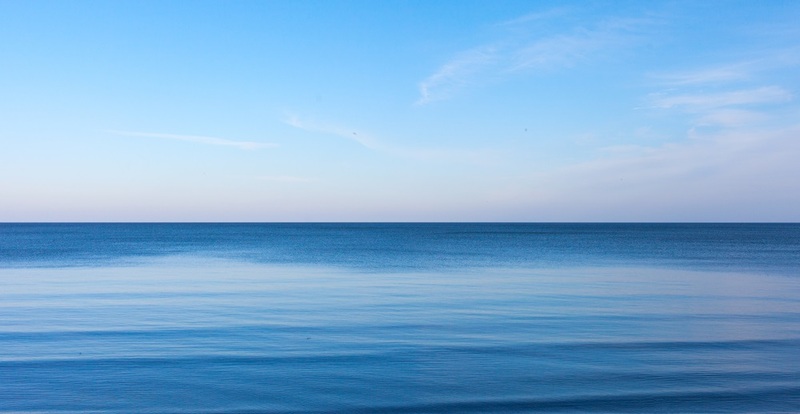 When we speak, we don’t think about taking air into our lungs, contracting our diaphragm, or moving our vocal folds, tongue or lips; it all happens automatically. Dopamine facilitates automatic movements, however in Parkinson's there is a considerable loss of dopamine. With less dopamine, automatic movements are disrupted, which can contribute to speech and swallowing difficulties. When we speak with intent or deliberation, we are using a system in the brain that is less dependent on dopamine. SPEAK OUT! 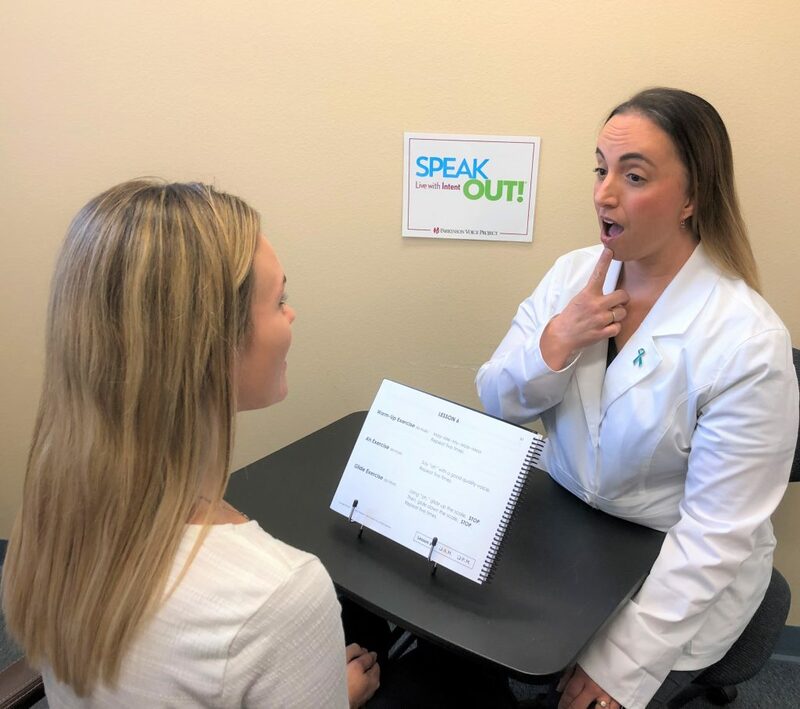 ® typically consists of twelve individual speech therapy sessions, three sessions per week for four weeks, conducted “one on one” with a licensed speech-language pathologist trained by the Parkinson Voice Project. Together, the patient and the speech-language pathologist work their way through a series of speech, voice, and cognitive exercises. 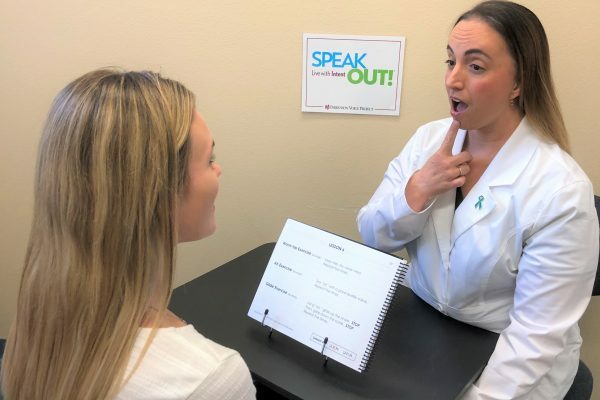 The goal of therapy is to strengthen the muscles used for speaking and swallowing and to teach patients how to speak with intent and deliberation. In comparison to LSVT LOUD, SPEAK OUT! ® consists of 12 sessions instead of 16, exercises are organized in a complimentary workbook provided by the Parkinson Voice Project to assist with compliance at home, and SPEAK OUT! ® also addresses cognition. 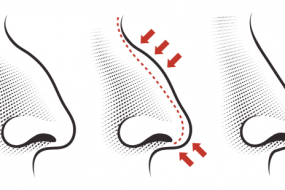 As part of our facial plastic services, Dr. Rothbaum performs rhinoplasty, which alters the external shape of the nose. 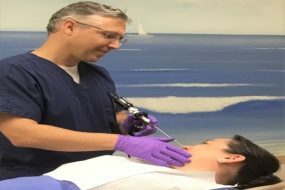 This is a service provided for patients who are unhappy with the external appearance of the nose, whether purely from a cosmetic standpoint or as the result of an injury. Great care is taken to ensure an aesthetically pleasing and natural looking result. 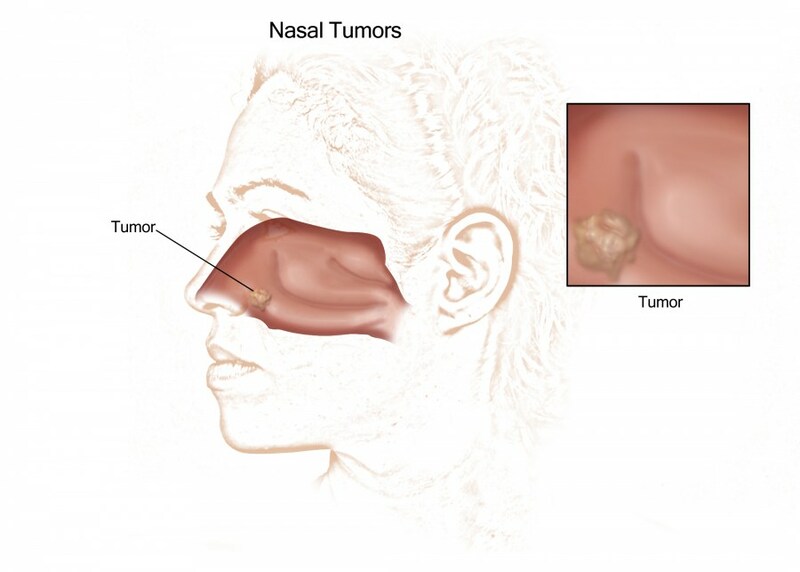 Nasal reconstruction may be performed after removal of a mass or lesion from the external nose. 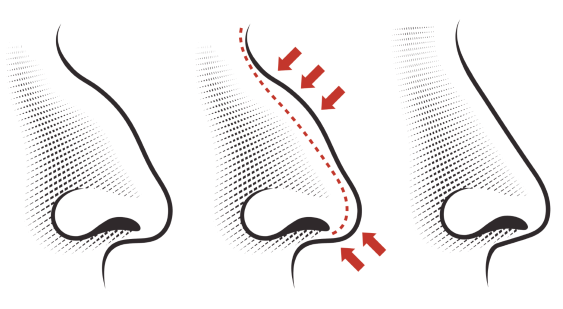 This is performed by Dr. Rothbaum in order to close the defect resulting from removal of a lesion on the nose while maintaining the natural shape of the nose as closely as possible. We offer reconstruction of the ear for those patients who have had a mass or lesion removed from this area. As with the nose, great care is taken to maintain as much of the natural shape of the ear as possible upon reconstruction. Nasal tumors can arise in any part of the nasal cavity, and may affect surrounding structures such as the roof of the mouth, the eyes and the brain. 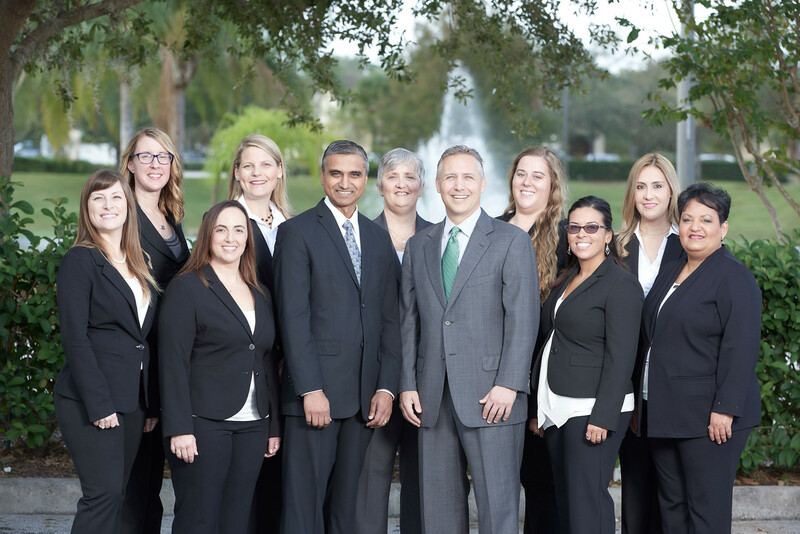 Dr. Shah and Dr. Rothbaum both trained at Johns Hopkins University and are experienced in this procedure. 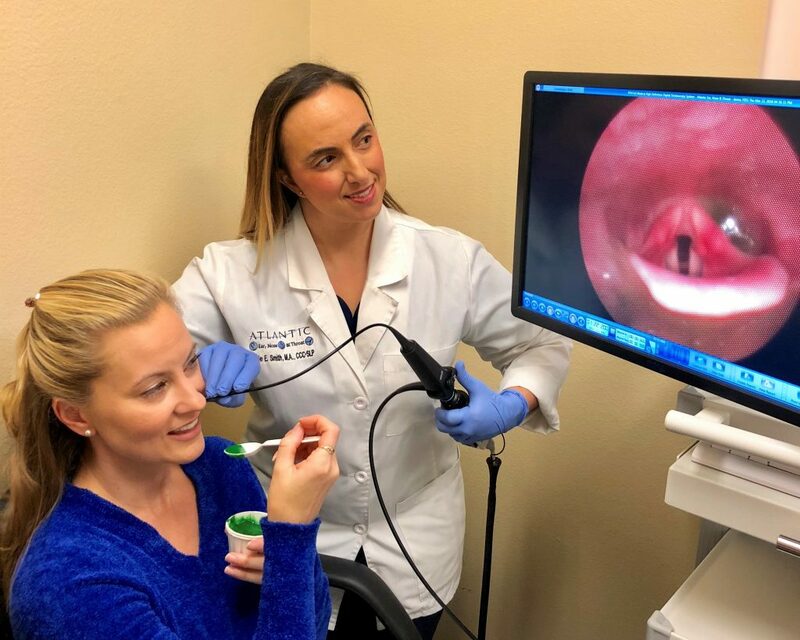 This training has given them detailed knowledge of sinonasal anatomy, which means reduced risk to those important structures that surround the nasal cavity and sinuses.